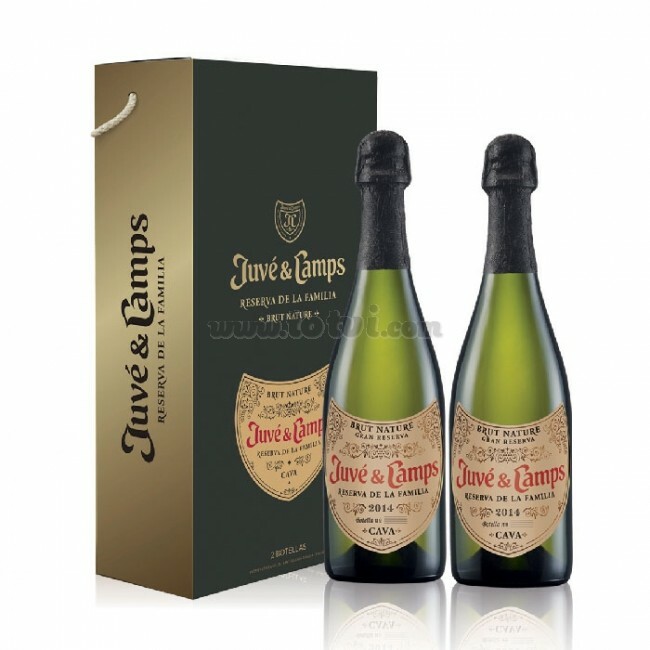 Green cardboard box with loop for 2 bottles of Juvé and Camps Family Reserve Brut Nature is a cava made from the flower must of grapes Macabeo, Xarel·lo and Parellada, harvested in the estates of Espiells, Can Massana and La Cuscona. An intense and elegant cava that evokes notes of ripe white fruit. The palate is creamy, fresh and broad. A great cava that will not leave you indifferent. Green cardboard box with loop for 2 bottles of Juvé and Camps Reserva de la Familia Brut Nature is a cava made from the flower must of Macabeo grapes (35%), Xarel·lo (55%) and Parellada (10%) , harvested in the estates of Espiells, Can Massana and La Cuscona.